The Ties That…Bind? published on 10 April 2012 Read more posts by the author of The Ties That…Bind?, Erin PtahNo Comments on The Ties That…Bind? Once upon a time in the Shineverse. This would be shortly after Jeeves and Wooster have gotten together, and well before Jeeves and Walter have been called up to fight WWII. In between lessons on tea-making and vampire-slaying, Walter also learns creative methods for keeping your employer’s wardrobe in check. Bertie, meanwhile, seems to have picked up his Aunt Dahlia’s terms of endearment-while-being-sort-of-demeaning-but-mostly-out-of-endearment-we-swear. Bertie: Reggie! 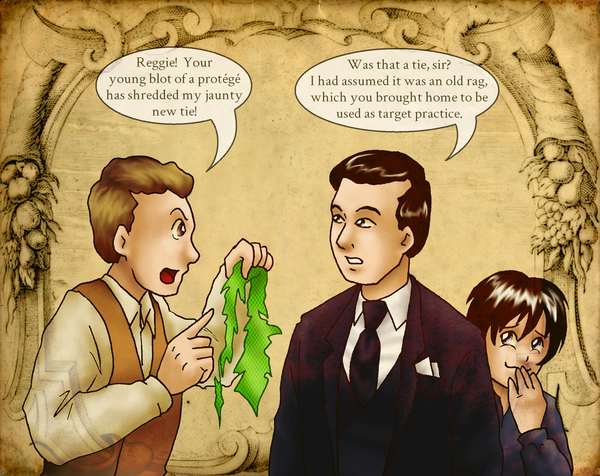 Your young blot of a protégé has shredded my jaunty new tie! Jeeves: Was that a tie, sir? I had assumed it was an old rag, which you brought home to be used as target practice.